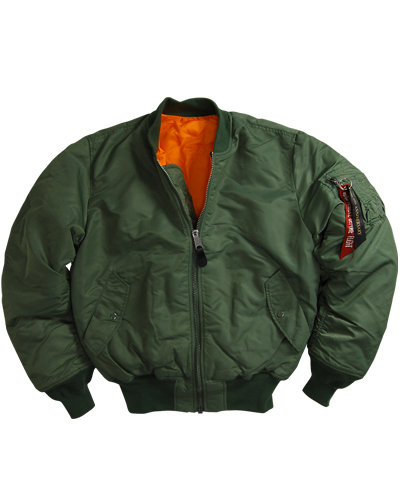 This MA1 Flight Jacket from Alpha Industries is known as the Authentic Alpha MA-1 Flight Jacket. Order between 12/16-12/20 Noon and get free 2-Day Shipping. Min $150 order. This class and authentic MA-1 Flight Jacket made by Alpha Industries features a nylon flight satin outershell with reflective nylon lining, polyester batting interlining, front closure storm flap, knit collar and cuffs, knit waistband, and Alpha's signature utility/pencil pocket. Available in a variety of sizes but please note that the TALL sizes are only available in the color Sage Green and Black. Often copied but never duplicated, the classic flight jacket made by Alpha for the military for over fifty years. This current version has been kept as close as possible to the classic specifications (dating back to the early 1950’s) and also received several revisions during the 1960’s. Reversible to high-visibility Indian Orange for use in emergencies. The MA-1 Flight Jacket is available in Sage Green, Gun Metal Grey, Replica Blue, Navy Blue, Stratos, Maroon, Black and in many sizes. Choose your preferences above. This flight jacket has a tight fit so we recommend ordering one size larger than normal. For more information on Flight Jacket sizing, please refer to our Flight Jacket Size Chart.